Der Klassiker Bayern vs Dortmund ended with der Rekordmeister absolutely embarrassing the Yellow and Blacks by tearing their closest rivals to shreds with a 6-0 victory. Lewandowski scores three against his former club. James picks up the player of the match award. 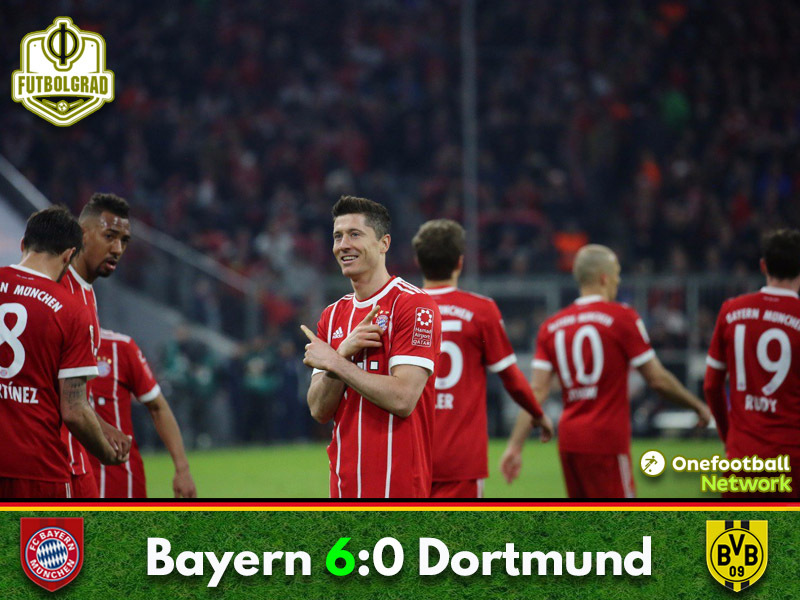 Bayern went into the match as the massive favourite and within four minutes had the lead after Robert Lewandowski broke free from Dortmund’s defence making no mistake in the one against one with Roman Bürki. Replays suggested that Lewandowski may have been offside, but the only body part that was offside was his arm, which does not count as a playable part, which meant the referees made the right call. Dortmund did not manage to recover from the situation, and three minutes later Bayern appeared to be up by two with Thomas Müller delivering an inch-perfect cross to Frank Ribéry, who made no mistake scoring from four yards out. But the goal was called back following Video Assistant Refereeing (VAR). On second glance the second goal seemed clearer onside then the first. It was a massive let-off for Dortmund, but Bayern remained relentless and in the 13th minute they had their second goal with James Rodríguez starting a play outside the box by playing the ball to the right to Ribéry, who crossed hard and low in the box where James had made a run to cap off the move with a shot from eight-yards out. Dortmund were carved open twice but continued to play attacking football allowing the Bavarians to much space going forward. As a result, Bayern soon had their third after Gonzalo Castro lost the ball in midfield with Lewandowski playing the ball forward to James, who delivered a fantastic cross to Müller and the national team forward made no mistake scoring from just six-yards out. It was Castro’s last action on the pitch as he was taken off by head coach Peter Stöger soon after, who replaced him with Julian Weigl. Dortmund tried to get on the scoreboard to stay in the match. But the Yellow and Blacks were poor in all areas, incapable to cleanly build from the back, let alone create chances. Bayern in the meantime were comfortable sitting back hitting Dortmund on the break. Bayern scored twice more that way. In the 45th minute, Ribéry ran on the byline, easily shaking off Lukasz Piszczek with Lewandowski pocking it across the line in the and then a moment later Ribéry broke loose from his defenders easily beating Bürki in the one against one. Bayern had scored five goals in the first 45 minute against a Dortmund side that had embarrassed themselves. Bayern were in firm control going into the second half. With the midweek game against Sevilla in mind, Bayern slowed down the pace significantly in the second half. Dortmund in the meantime seemed shellshocked offering little to no resistance. In the 66th minute, Dortmund finally showed a sign of life with Mario Götze unleashing a shot from 20-yards that hit the outside the post. But at the same time, it was telling for BVB that even that chance was ruled off as Michy Batshuayi and André Schürrle were both offside. With Bayern taking the foot off the gas pedal the game lost significant steam. But Bayern still created chances with Lewandowski forcing Bürki to make a good diving stop in the 74th minute. With three minutes to go Lewandowski had completed his hattrick. Joshua Kimmich picked up the ball just outside Dortmund’s box and played a one-two with Müller before crossing the ball low and hard into the six-yard box where Lewandowski had to tap the ball home. It was the final moment of the match in which Bayern were in control for the full 90 minutes highlighting why they are Germany’s number one club. It was another stellar performance by James Rodríguez. The Colombian midfielder scored one goal and picked up two assists. He also created the buildup play that led to Bayern’s fourth goal just before halftime. The midfielder has been on fire this season creating a chance every 28 minutes this season. Signed on loan from Real Madrid Bayern paid just €13.3 million for the loan deal. The Bavarians also have an option to make the deal permanent for another €42 million. With Bayern likely to make the deal permanent at some point James would be the most expensive signing in the Bundesliga history, but in the current market would be an absolute steal. Dortmund are a broken club. One of the key stats of the game was that Batshuayi had just five touches in the entire game. The stat is reflective of the entire Borussia Dortmund side, which was an absolute disaster in every area on the pitch. CEO Hans-Joachim Watzke and sporting director Michael Zorc now face the task to rebuild a club that is only a shadow of its former self. Peter Stöger picks up his first Bundesliga defeat with Borussia Dortmund. Going into the match James Rodríguez had created a chance every 28 minutes. Dortmund have not conceded five goals in the first half of a Bundesliga game since April 1978 (0-12 in Mönchengladbach) when they were down 0-6 at halftime. Overall this was Dortmund’s biggest defeat since losing 0-6 against Bremen back in 1984.